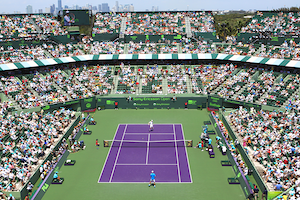 In their semifinal encounter at the Sony Ericsson Open, Andy Roddick defeated Rafael Nadal 4-6, 6-3, 6-3 to reach his second straight final this year at an ATP 1000 Masters event. Following a game where Roddick allowed Nadal to touch the ball only once, his next time up, the American dropped serve. Although Nadal had to salvage break point, he consolidated and got his nose in front 3-1. The balance of the set, Roddick put on a service clinic. However, the single break was sufficient for Nadal to grab the first set. In the second set, Roddick upped the ante by being more aggressive. Although Roddick failed to capitalize on his second break point, with Nadal serving at 3-4, Roddick baited him into two miscues. In addition, with a forehand up the line winner, Roddick obtained triple break point. Then by sticking a crosscourt forehand winner, Roddick gained the break for 5-3. Next, with a love game, Roddick held to send the match to a third set. In the decisive set, after Nadal guarded serve at love, he forced an error from Roddick to procure break point. But, with a big serve, Roddick provoked a backhand return error for deuce. Later on, with two huge volley winners, Roddick equalized the set at 1 all. Soon, by zeroing in on a volley by Nadal, Roddick made a sensational lob. Despite Nadal tracking that shot down, his only option, the tweener traveled long resulting in double break point. When Nadal netted a forehand, Roddick went up a break 2-1. Whilst Nadal did his utmost to make a push on Roddick’s service games, he was unable to find the key. Serving at 3-5, Nadal sliced a backhand volley into the net, handing Roddick match point. 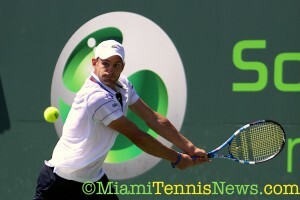 With the Spaniard’s forehand landing wide, Roddick placed a period on the match. Q. What do you think made the difference out there in today’s match? NADAL: Well, I think I started the match playing pretty well in the beginning. Later, I had the match well under control in the first set with my serve. . . in the second set Andy was serving well . . . I didn’t have a lot of chances on the return. He play[s] very aggressive game and started to play more aggressive[ly] in the game where he did . . . break. It was a change and it was [a] surprise for me. After that, in the third, you know, he put more pressure on my serve, attacking more. He was serving very regular, pretty well the third, second. Just congratulate him. He’s playing really well. Despite the disappointing result today, Nadal is pleased with his performance the last couple of weeks. The Spaniard hopes that success in terms of the titles is around the corner. After coming up short at Indian Wells, for the second tournament in a row, Roddick attempts to collect his fifth career Masters’ shield. Roddick’s last one was in Cincinnati in 2006. This is the American’s second time in the finals in Miami. In 2004, he beat Guillermo Coria in the title bout. On Sunday, Roddick will meet either Robin Soderling or Tomas Berdych. These two have their semifinal encounter tonight.